NEW! The ONLY book on this difficult garden problem! From world-acclaimed plantsman and garden writer, Graham Rice, here are the solutions for the worst spot in your garden, Dry Shade. Planting The Dry Shade Garden fearlessly tackles the most difficult situation in the garden, the place that makes gardeners despair and want to move house, or give up gardening and take up bridge - that dry and shady place where you think nothing will grow. Well, think again. Don't assume it's no better than the ideal site for the shed. 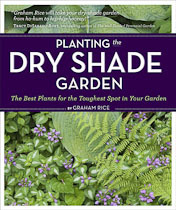 Graham Rice has put together an entire book full of plants that will do well in dry shade and bring beauty to your garden. "Graham Rice will take your dry-shade garden from ho-hum to hip-hip-hooray!" "…a how-to manual, that fills you with have-a-go inspiration." "Dry shade presents particular challenges for the gardener. Here’s a book that tackles the problem..."
Listen to two of Graham's radio interviews about solving the problems of Dry Shade. Planting the Dry Shade Garden gives some simple guidance on how to make dry shade both less dry and less shady. These are basic things you can do to expand the range of plants you can grow in dry shade, from shrubs, climbers, perennials, ground covers, bulbs and annuals, foliage plants and, yes, even lots of flowers. By combining simple steps to improve the situation with a smart choice of plants, dry shade stops being a problem and becomes another area of your garden that you can make beautiful. Planting The Dry Shade Garden explains how. The photography in the book is mainly the work of award-winning photographer judywhite, so not only is the book packed with good advice, but the pictures reveal the beauty of the plants you can grow. Jane Powers in The Irish Times. Read the whole feature and review. “I am nodding in agreement with most of his choices, because I have been dealing with the phenomenon for 17 years.” Adrian Higgins, Washington Post. Read the whole Washington Post review. Read the whole amazon.com review. "Award-winning gardening writer Rice offers this useful guide to gardening in dry, shaded spaces. The challenges of gardening in these types of spaces are obvious; plants need sunlight and water to survive. Rice provides expert advice on transforming dry shade spaces into inhabitable gardens." Vancouver Public Library Read the whole Vancouver Public Library review. Victoria Summerley of The Independent on her Victoria’s Backyard blog. Read the whole blog post.